J. Yuxun, S. Zomorodpoosh, I. Roslyakova, L. Zhang. Results of thermodynamic re-assessment of binary Cr-Nb phase diagram from 0K using segmented regression model. 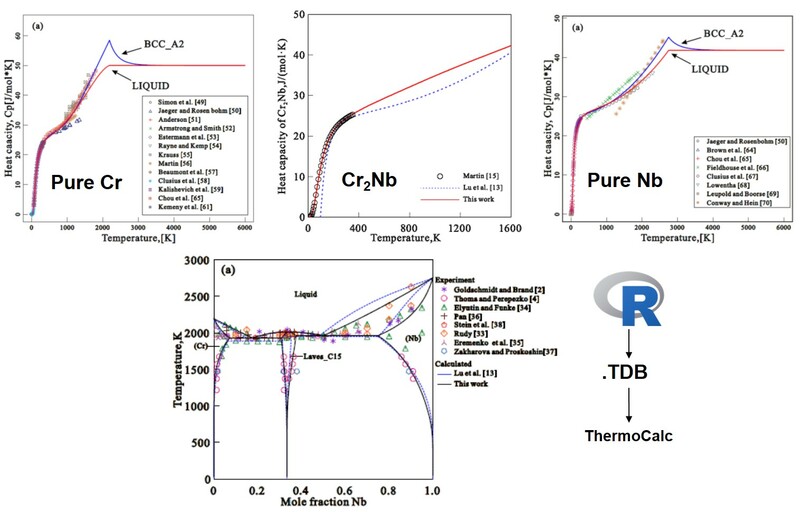 Upper graphs show obtained heat capacities for solid and liquid phases pure Cr, Nb and Cr2Nb compound modeled by segmented regression model from 0K. Based on the recently proposed physically-based segmented model, the descriptions for Gibbs energy of pure Cr and Nb down to 0 K were first established. After that, a thermodynamic re-assessment of binary Cr-Nb system down to 0 K was then performed by taking into account all the experimental phase equilibria and thermodynamic properties. Especially, the experimental heat capacities of Cr2Nb at low temperatures ignored in previous assessments were utilized in the present assessment. The calculated phase equilibria and thermodynamic properties according to the presently obtained thermodynamic descriptions of binary Cr-Nb system agree well with most of the experimental data, and show better agreement than the previous assessments.